Inga Svala Thorsdottir (born Iceland, 1966). Icelandic. Studied at the Icelandic School of Arts and Crafts and Hochschule für Bildende Künste, Hamburg. Wu Shanzhuan (born Zhoushan, China, 1960). Mainland China. 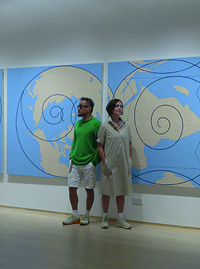 Studied at China Academy of Art, Hangzhou and Hochschule für Bildende Künste, Hamburg. Live and work in Hamburg.